What is INC 22A ? Active Company Tagging Identities and Verification is a process that Registrar of Companies (ROC) came up to tag Active and in-active companies to act against all the in-active companies from using resources such as banking system and other privileges. Who should File INC 22A ? All registered companies before 31st Dec 2017. I have filed KYC norms as a Director, do i still to file INC 22A form ? Yes, KYC is related to Directors of a Company. INC 22A is similar but for a Company and to establish that the company is Active. You need to file one form for one Company, irrespective of number of directors in the Company. EZTax.in preferred this process could be inferred from the returns, and director KYC process and avoid following this process completely, but it's a compliance already mandated to follow. This certainly cause lot of noise among Companies as is against ease of doing business. Download the e-Form ACTIVE / INC-22A and fill the information. but this need to be digitally signed by Company Secretary. Check with EZTax.in Rep as early as possible. 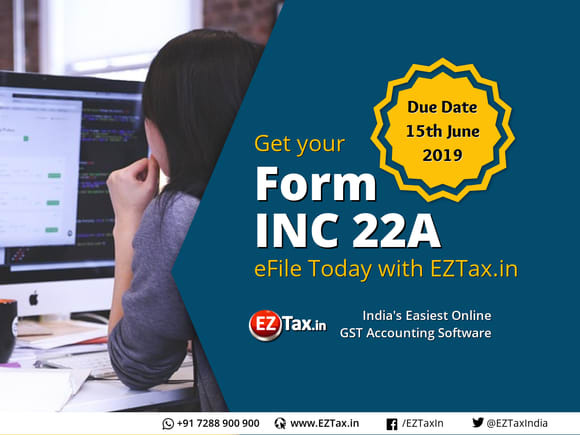 What's the deadline to file INC-22A ? What are the consequences of not filing Form INC 22A ? What would be the Penalty ? Rs.10,000 would be charged after the due date. Any restrictions in filing INC-22A ? What information, documents needed to fill the Form INC-22A ?